Fifth-ranked Northwestern outscored Doane 28-3 in the first quarter to earn a 79-49 win over the Tigers in a GPAC match-up played tonight at the Bultman Center. The Red Raiders won their 12th straight and improve to 9-1 in the conference, 15-1 overall. Doane slips to 0-10 in the conference, 3-14 overall. Leading 4-2, Northwestern closed the first quarter with a 24-1 run, holding Doane without a field goal for over eight minutes, for a 28-3 advantage. Kassidy De Jong scored 11 of her team-high 14 points and Bre Schuiteman scored seven in the opening quarter, a period that ended with a Sammy Blum three-pointer. A transition basket by Schuiteman put the Red Raiders in front by 28 (41-13) at the three-minute mark and the hosts led 45-18 by halftime. Coach Yaw’s squad shot 54% and limited Doane to 24% in first half. Northwestern outscored Doane 18-16 in the thrid and pushed its lead to as much as 33 after a Blum three-pointer early in the fourth quarter (69-36). Four Red Raiders scored in double figures, led by De Jong with 14 points, who also pulled down seven rebounds. 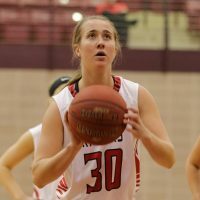 Blum scored 13, as did Darbi Gustafson, who netted 10 in the final half. Schuiteman contributed 11 points and five boards and Anna Kiel scored nine to go with seven boards in her season debut. Northwestern shot 42% for the game and outrebounded Doane 44-36. Doane shot 28% for the game and went 4-for-14 (29%) from the three-point line, led by Emma Areman with 18 points and six boards. Sidney Blackburn scored 12 and added six rebounds.